Known for its audacious, avant-garde approach to car design, Citroën is celebrating the birthdays of two of its flagship creations. The 2CV and the Méhari: one originates from the other. 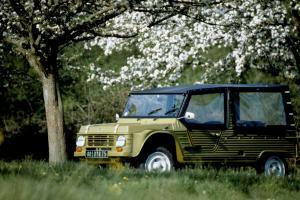 Both of these unique vehicles – the only ones of their kind – were mainstays in Europe for many years. 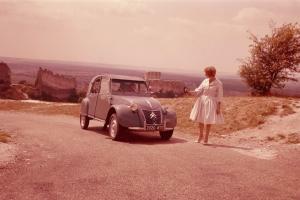 Home-grown in France, the 2CV celebrates its 70th birthday this year. It all began back in 1936. 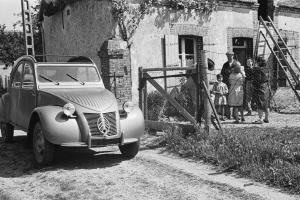 Hidden away in Citroën’s design offices, Pierre Boulanger – who had pioneered the front-wheel drive Traction Avant – was tasked with building a comfortable car that could carry four people at 50 km/h and use no more 5 L per 100 km. The car was to feature a radical new design to keep the price as low as possible. Three letters effectively summed up the specifications of this popular vehicle – a mini car of sorts: “TPV”, meaning très petite voiture or very small car. 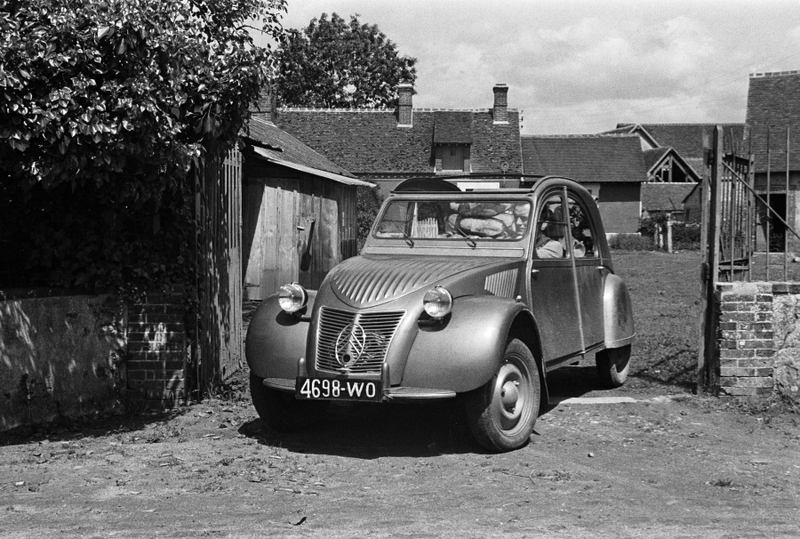 In 1938, the first prototypes were driven through the countryside around La Ferté-Vidame where Citroën had just set up its first test circuits. The TPV was a radical departure from everything people had known about cars up to that point. It had only one headlight and the whole roof was made of canvas which could be rolled completely open. The outbreak of war put a stop to all design work and to avoid the project falling into enemy hands, almost all of the pre-series cars were destroyed. Three of them would later be unearthed in 1994 in the attic of a building at the Perche test centre! 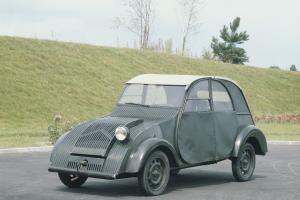 Developed during France's Popular Front alliance period, the 2CV broke the ice at the Paris Motor Show on 7 October 1948 at the Grand Palais. Often described by Citroën itself as an "umbrella on four wheels", the new car strayed well away from the beaten track, refusing all compromise and disconcerting people with its eccentric look and rustic simplicity. The press had a field day with this ugly duckling. Designed neither to be put on show, nor to win people's hearts, impervious to changing fashions, the 2CV was seen as a ray of sunshine. The general public got right behind this concept which was ideal for getting as many people on the road as possible. By 1950, delivery times for this car had already stretched to six years. Its standing as every man's car was confirmed by Vincent Auriol who left the Elysée Palace at the end of his presidency in 1954 at the wheel of a 2CV. Refusing all labels in a status-hungry society, the 2CV’s timeless reign spanned eras and decades. The last one rolled off the Mangualde production line in Portugal. In 42 years, 5,114,959 vehicles were built. A record for Citroën. Fifty years ago this year – 20 years after the first 2CV rolled off the production line – Citroën took the world by surprise once again with the Méhari. Named after a North African camel, this curious beast was first unveiled on 16 May 1968 at the Deauville Golf club, right in the middle of the student protests which were paralysing France. Plastics industry pioneer Roland de la Poype was behind the design of this pretension-free leisure vehicle which featured flexible plastic body-tinted thermoformed kralastic bodywork that resembled that of a pick-up truck. A sort of French-style Mini Moke, the Dyane 6 (its official name) could be washed by simply hosing it down. Available in three colours when it was launched – sand ochre, bright red and forest green – 150,000 Méharis were built up until 1987, including four-wheel-drive versions in 1979.